I've commented about this before on my DSLRbodies site, but we're now seeing the same Nikon behavior in mirrorless that we've seen from them before. Nikon's generally good at prioritizing building bodies, and to a lesser degree, basic lenses. In the case of the Z6 and Z7, we have plentiful bodies available to purchase, and have had extra stock available since pretty much day one. Likewise, the first three Z S-line lenses all seem in good supply. Look beyond that, though, and Nikon is pretty much a total failure at delivering. The promised battery grip is still missing in action. No one knows what happened to the GP-1 (Nikon GPS unit that would work with the Z's). The WT-7 as the high-end Wi-Fi companion for the Z's is a joke. The EH-5c AC adapter also seems missing in action. Nikon's basic HDMI cable is in short supply for some reason. The DK-29 replacement eyecup is in short supply, too. And these are just the accessories listed in the Z camera manuals. The Nikon XQD card seems to only be available in Japan. The rumored Z-friendly Speedlight is nowhere to be seen (we need it to restore off-camera Autofocus Assist, among other reasons for it to exist). Most importantly, all the screw-drive Nikkor lens owners are patiently waiting to see if Nikon will ever deliver an FTZ+screw adapter. I can name plenty of other accessories that just aren't there, too. And don't get me started on not seeing the hump on the camel: try plugging an WR-R10 into the camera to remotely control it while shooting video. Oops, if you're recording externally, the WR-R10 interferes with the HDMI cable. You can't get there from here. I write that interchangeable lens cameras are really the base of an ecosystem. Most serious shooters eventually obtain far more than just a body and lens. Indeed, the more extensive and available the ecosystem components are, the more likely we're going to purchase the product at the center (the camera body). Nikon wants to be in complete control of their ecosystem. They don't publish lens mount, flash mount, remote connector, or other specifications to other companies, meaning that those other companies have to reverse engineer what Nikon is doing if they choose to play in the Z ecosystem. The reason why Sony got third-party lens support so fast is that they did the opposite: they allowed anyone to sign an agreement netting them the lens mount specifications and communications. 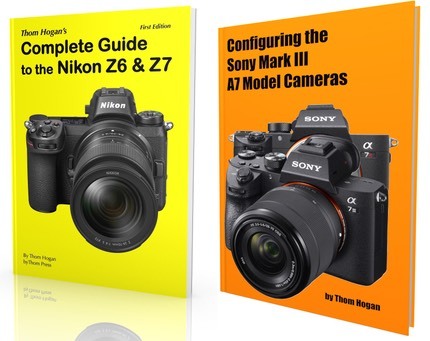 If anyone at Nikon HQ is wondering why the Z6 and Z7 body sales didn't rocket off as fast they thought they should, it's partly because the complete ecosystem isn't there, and no one at the moment believes that it will become as complete as some competitor's, particularly Sony. Who wants to buy into an incomplete ecosystem? To give credit where it's due, Nikon did make two small moves with the Z ecosystem: (1) they've been working with Atomos to extend the Z's video capabilities; and (2) they changed the NEF format so that Adobe is now picking up some basic XMP data from the camera. Moreover, in the Z6 Filmmaker's kit, Nikon didn't stick us with the Nikon ME-1 stereo microphone—which is in good supply in the retail chain, but basically a low-end product—but put the far better Rode Videomic in instead. Still, the overall issue is the same as we've had before with Nikon: a flood of camera boxes, a trickle of accessories. Nikon either needs to fix and promote their accessories effort or they need to turn to outside companies to fill the gaps ASAP. What they're doing right now is a repeat of a failure they've made multiple times before, which indicates someone in corporate is making product management mistakes that are costing the company in its core expertise. There's also a lack of modernism and imagination in the accessories side of Nikon. An external GPS that doesn't draw much camera power? No, we don't have anything from Nikon that would run Bluetooth to a modern remote GPS unit. External battery power to the camera? Nope. True 802.11ac speeds? Nope, not even from the WT-7, though it has much more throughput than the internal Wi-Fi. Multiple camera control from one camera (e.g. one camera controlling a three-shot setup with the same settings)? Nope (and see what I wrote about the WR-R10 interfering with the HDMI cable if you think you can even get basic "start all cameras together" support when doing video).